The verbs ‘to join’, ‘to attend’, ‘to participate in’, ‘to agree with’ and ‘to support’ can all be expressed in Turkish by ‘katılmak’. This is the another post in our category ‘In English, how to express …?’ where we discuss language concepts that our Turkish students often struggle with in English. Today, katılmak. Last week he attended the conference in Ankara. I’ll join the lesson this evening. She participated in the managers’ meeting this morning. I agree with your position on the subject. I support your view on this subject. Would everyone who wishes to attend the dinner let me know by Friday afternoon? All pupils are expected to attend school assembly. I don’t think there’s any need for all of us to attend the meeting. He joined the tour to Central Anatolia. Would you like to join us for dinner tonight? You must join the queue to buy tickets for the movie. We encourage members to participate in the meetings. I don’t like to participate in team sports. Many countries participate in the Olympic Games. I agree with your idea. I support the government’s decision not to cut down the trees. I support her position on the death penalty. Question: It was already 8pm. Murat was tired and did not want to attend/participate in/support the meeting. All he wanted to do was leave the office and return home. 2. Although Gökçe joined the meeting on time, she really did not want to support/to participate/to agree with it and she stayed silent during the entire meeting. 3. ‘Uğur and Nil are getting married next week. Even though they are not close friends, we are planning to attend/to join/to agree with the ceremony. 4. ‘Uğur and Nil are getting married next week. Uğur is my best friend and so he asked to me to attend/to participate in/to support the wedding ceremony. I will read a speech. 5. ‘OK… we are going to cinema at 6pm tonight to see the new zombie movie. Do you want to support/to join/to participate in us? 6. Canberk failed his final science exam and now he must agree with/support/attend summer school. As always, please let us know what you think and if there are any other topics you would like us to cover! Welcome to the second post in our İngilizce Türkiye’de series. In our first post we introduced a great place for traditional Turkish breakfast, or kahvaltı, called Van Kahvaltı Evi. 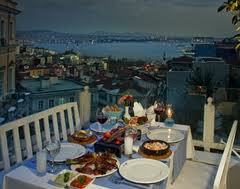 In our second post we will highlight Eleos Restaurant with two locations in Istanbul. In our İngilizce Türkiye’de series we highlight establishments across Turkey that offer great service as well as great command of the English language. Eleos has two locations in Istanbul, one in Beyoğlu and one in Yeşilköy. On a recent trip to the Beyoğlu location we were impressed with the food, the view and the service offered in English to our foreign colleagues. The food at at Eleos is that of a fish mezze house but with a more distinct Greek flare than your traditional Bosphorus fish restaurant. Like a typical Istanbul fish restaurant there was a three-course approach to the meal – cold mezze (vegetarian and fish), hot mezze (fish and seafood) and fish (grilled or fried whole fish). What separates Eleos’ food from other fish restaurants in Istanbul is the variety of ingredients. For example, we tried Oyster mushroom mezze, lobster in yoghurt, fried sole stuffed into peppers and fish kokorec. The lokanta is dressed up as an Agean Greek fish restaurant, with blue and white tablecloths, wood paneling and al fresco ambiance. If you book ahead, be sure to ask for a table on the heated patio in order to get a commanding Bosphorus view over Beyoğlu. At Eleos there are many thoughtful touches that make the dining experience more enjoyable than at a typical restaurant. Several mezze dishes are brought out “on the house”. A welcome aperitif and an extensive desert tray are delivered to the table as “compliments of the chef”. As always, if you know of any establishments that should be commended for their İngilizce Türkiye’de, please let us know. In our İngilizce Türkiye’de series we highlight establishments across Turkey that offer great service as well as great command of the English language. We think the series is a good way to discover great restaurants, destinations, attractions and services, as well as highlighting establishments in Turkey where English speakers can get service in the global language. 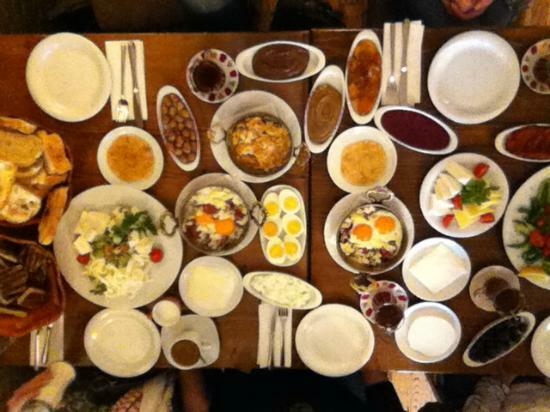 On a recent morning walk in Cihangir, myself and my co-founder found ourselves very hungry. Both of us are big fans of an Aegean breakfast. As we walked towards Taksim we noticed a Kahvaltı Evi that was packed at 9 am on a Thursday. We decided to check it out. Van Kahvaltı Evi is not an Aegean kahvaltı but hails from the eastern parts of the country. The Kurdish regions of Turkey take their kahvaltı very seriously. There are many similarities to an Aegean Kahvaltı with some key differences including Van cheeses, tangy cacık (thick yogurt spread) and murtuğa, a heavy wheat flour porridge. Of course, you will find the typical tomatoes, cucumbers, olives and white cheese of an Aegean kahvaltı. The food at Van Kahvaltı Evi is generous in portion, very fresh and reasonably priced. What we were most impressed with is the service. Both of our waiters, and the man who brought us our bill spoke a great level of English. Additionally, both had commanded some of the finer elements in translation of Turkish service to English. While in Turkish it’s quite acceptable to simply use a single noun in isolation, such as ‘bread?’, ‘tea?’, ‘bill?’ for example, it usually grates on the ears of a native English speakers as it can border on rudeness. It’s a small thing but these couple of phrases make such a difference to the quality of service. TurksLearnEnglish.com is excited to announce the launch of our series: İngilizce Türkiye’de. In this series we will highlight great venues across Turkey, such as restaurants, galleries, tourist attractions and entertainment facilities. 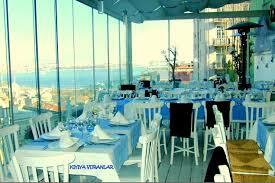 We will focus on establishments where the Turkish staff has a strong command of the English language. Our inspiration for this series is both to highlight great establishments for residents and visitors to Turkey, and also praise establishments with a strong command of the English language. We will also use this series to highlight language lessons related to the service industry. For a Turkish native speaker to adapt to a service culture in English, there can often be challenges. Much of the time, literal translations from Turkish into English don’t work well. Can I take your name? Unfortunately, the very question ‘Name?’ used by Turkish Starbucks staff is not polite English. We hope that you will enjoy our İngilizce Türkiye’de series. If you know of any establishments across Turkey that should be highlighted for their great command of the English language as well as providing a great service, please let us know! Whether it be a restaurant, an entertainment venue, guide or tourist attraction we would be happy to hear from you! The concept of ‘izin’, often translated as ‘permission’ or ‘consent’ in English, is a word with a wide range of meanings in Turkish. In this post, the second in our ‘In English, how to express… ‘ series, we’ll look at the most common ways in English to express the concepts of ‘izin almak’ and ‘izin vermek’. If you prefer a video lesson, why not check out our Ingilizce Dersleri video library. We have a series of great lessons in a video format. First, let’s look at a few ways to express ‘izin vermek’. The boss allowed me to take the afternoon off to see the doctor. The government would not allow him to enter the country. You’re not allowed to speak during the exam (Note that ‘to be allowed’ is a commonly used in English). The boss gave me permission me to take the afternoon off to see the doctor. The school gave her permission to take the exam again. The IT department would not give him permission to access the files. When I was young my parents wouldn’t let me stay up late. My boss let me take the afternoon off to visit my father in hospital. They let me take a 10-day vacation in August. Now let’s look at ‘izin almak’. In English the simplest way to express this concept is with ‘to get permission’. I couldn’t get permission to access those files. He got permission to leave work early so he wouldn’t miss the plane. We got permission to enter the building after we showed some personal ID. Note: Don’t use ‘to take permission’. It’s Turklish and not natural English! I took permission to leave early. I got permission to leave early. They allowed me to leave early. They let me leave early. They gave me permission to leave early. For each situation below, form a sentence using each of the verbs. You want to attend a conference on Friday. You ask your boss but he says that you have to work. (to allow) He won’t allow me to attend the conference. (to give permission) He didn’t give me permission to attend the conference. (to let) He won’t let me attend the conference. (to get permission) I didn’t get permission to attend the conference. 1. You made an appointment to see the doctor at 3pm tomorrow. Your boss agrees that you can leave work at 12pm. 2. You asked your mother if you could go to the cinema with your friends tonight. She said ‘no’ because your grandparents are coming to visit. 3. Your best friend arrives in town tomorrow afternoon. You haven’t seen him in three months so you ask your boss for a day off. She says ‘no’. 4. You want to borrow your dad’s car to drive to Ankara tomorrow. He say’s that it’s fine. as long as your drive safely. The concept of ‘failing to do what you planned’ … as in kaçırmak: uçağı kaçırdım, dersi kaçırdım, randevuyu kaçırdım, can be tricky for Turkish students in English. This is the first post in our category ‘In English, how to express …?’ where we discuss language concepts that our Turkish students often struggle with in English. Today, kaçırmak. Sometimes, because of bad weather, heavy traffic, too many appointments or just maybe even because of laziness, life does not go as planned. You cannot do everything in your diary. 1. When you have something planned in your diary, but you are not able to do it, or failed to do it, you use ‘to miss’. On Wednesday morning you had a doctor’s appointment at 10am. You were in traffic until 10:50am When you arrived at the doctor’s clinic, it was no longer possible to see the doctor. You missed the doctor’s appointment (because you were stuck in traffic). Or, your homework was due yesterday at 5pm. You give the homework to your teacher the following morning. Your plane departed at 15:10. You arrived at the airport at 15:30. Question: Umut’s flight to Ankara left at 6pm. He arrived at the airport ay 6:15pm because of bad weather. Answer: Umut missed his plane because of bad weather. 1. Murat couldn’t attend his biology exam because he was sick. 2. Kaan didn’t go to his dentist because he got stuck in traffic on the F.S.M. bridge. 3. The outdoor concert started at 20h00 but Aslı didn’t attend because the weather was terrible. 4. The snow was so heavy that Yiğit couldn’t drive his car to go to the meeting in Levent. 5. The plane left for Bozcaada at 12pm. Unfortunately, Pınar got stuck in bad traffic and she didn’t take the plane. 6. The lesson started in Beşiktaş at 6pm. Ali was still in the office at 6:50pm! Don’t say ‘He didn’t catch the lesson’. It is not natural English in this situation. Say, ‘He missed the lesson’.